If you are in or around Panama City and Panama City Beach, Florida and are looking for a new deck, pergola, patio cover, sunroom, screen room or pool enclosures, we do it all. If Hurricane Michael has affected you or you’re just looking for a new screen room, sunroom, pool enclosure, patio, deck, or pergola, we can create an idyllic backyard environment for bbqing, entertaining guests, or simply appreciating the natural scenery around your home. Because we offer a vast array of outdoor living solutions – including awnings, screen rooms, and patio enclosures – we can create an outdoor space that is perfect for your lifestyle. 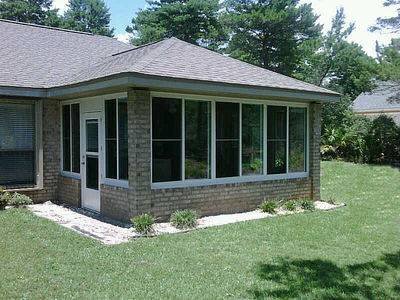 At Home Contracting, Inc. has been custom building enclosures for more than 20 years. The first step in creating your dream enclosure is to choose a design that suits both your needs and that fits with the architectural design of your home. There are endless designs to choose from and many combinations of sizes, finishes and options – more than most competitors. Adding a sunroom to your home can bring the longer term benefits of added value to your home. Sunrooms have become quite popular in many homes these days. You are designing a private “get away” spot in your own garden by adding a sunroom to your home. You can spend hours and hours in your room addition relaxing and enjoying the natural light. On the other hand, a they will increase the square footage of your existing home. A sunroom also makes a perfect place to entertain, a place for the children to play safely and is the ideal link between your home and garden. They provide a unique and beautiful atmosphere for entertaining, dining, relaxing, and a perfect spot for a hot tub. It can also add to the curb appeal of your home and increase its resale value as a result. It can also be considered a home addition that extends the warmer season. Traditional and contemporary sunrooms and conservatories will add light, elegance and a spacious look that will blend perfectly with any style home. Each patio room, conservatory and sunroom design comes in a variety of sizes, roof and frame finishes, door choices and many other features. If our basic designs are not exactly what you need, we’re happy to custom design and build a new sunroom addition just for you. We also replace windows and install window shades. A Screen Room is a pleasant way to keep the sun out, feel a cool breeze, relax and breathe the fresh air. It’s also a great place to entertain. No bugs, no leaves! Screen rooms are screened-in rooms that allow you to enjoy the beauty of the outdoors without worrying about insects, wind, or bad weather. Screen rooms can also offer homeowners a unique spot to enjoy the great outdoors without having to deal with the hot sun, pelting rain, or annoying pests. Additionally, they can provide extra square footage that can be used to entertain guests, workout, or simply relax. 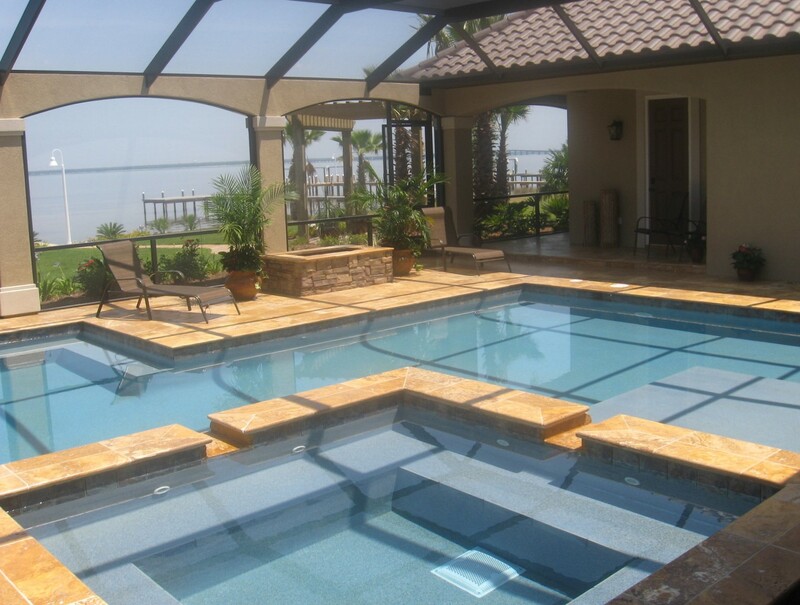 Our Pool Enclosures can greatly increase the usage of your pool. We offer both a seasonal screen enclosure to a year around enclosure with many roof styles to choose from. We can place one on an existing pool or can coordinate with your swimming pool contractor. Your family and friends can enjoy poolside play, water sports and daily swims without sacrificing the carefree feeling of being outdoors. Delight in the comfort of swimming in your pool without the annoyance of outdoor pests in a new pool enclosure. A Patio Cover or Carport is a welcome addition to any home. They increase beauty, functionality and value of your property at minimal expense. A Patio cover or Carport installed by At Home Contracting is extremely durable and virtually maintenance free. No rust, no rot, and no painting! They offer protection from the sun and rain and can easily be converted into a room later. Carports and patio covers are a convenient way to increase the function of your outdoor spaces and add to the exterior design of your landscapes. Imagine all the possibilities a fully customized wood or composite deck has to offer. How about a beautiful pergola to maximize your outdoor living space? Want to experience luxury in your outdoor living area for your home or garden? At Home Contracting, service Panama City and Panama City Beach, Florida Inc. offers an endless list of solutions for your backyard living needs. A patio, deck, or pergola is the perfect extension of living rooms or kitchens. Outdoor living spaces are great for entertaining, dining, or relaxing in the outdoors. Decking does not have to follow a square pattern. Materials with recycled content do not need to be re-stained, and feature a wood grain finish within its profile.